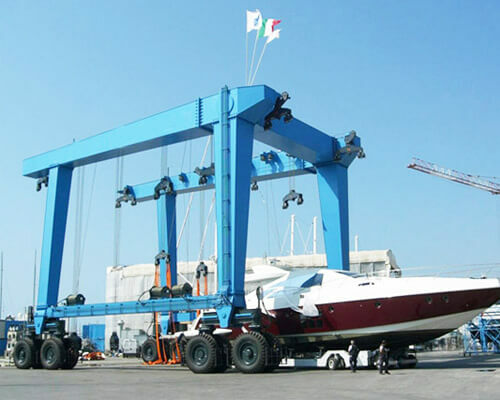 Marine hoist is very flexible in boat handling operations since it is designed to be mobile. 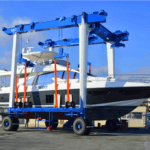 If you need to launch your boat, hoist the boat out of the water, or transport in the yard, a mobile marine boat hoist is a perfect option. This equipment is extensively found in small to large marinas, shipyards, commercial yards, yacht clubs and other occasions that require to handle vessels approaching 25 tons to over 1200 tons. The equipment falls in two main types in terms of power source, including electric and hydraulic system. 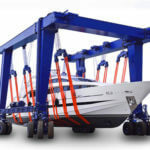 Generally, hydraulic marine boat hoist is the most common type used to handle a variety of vessels. It is ideal for heavy duty applications, and delivers great strength, higher efficiency and durability. The electric boat lift is a cost-effective option, which is suitable for handling small tonnage vessels. If the boat you need to handle weighs 25 tons or 50 tons, we can design an economical electric drive system for the machine. We also offer custom design to suit all special requirements. All our machines are built to the latest safety standards so as to exceed customer’s expectations for efficiency, safety and reliability. 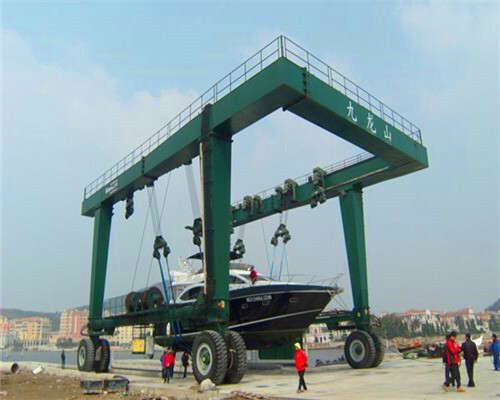 The marine mobile boat hoist is engineered for different uses, such as to launch a newly built boat, lift a vessel out of the water for repair or maintenance, transport in the yard to arrange these vessels in a row in order to improve the utilization of limited yard space. 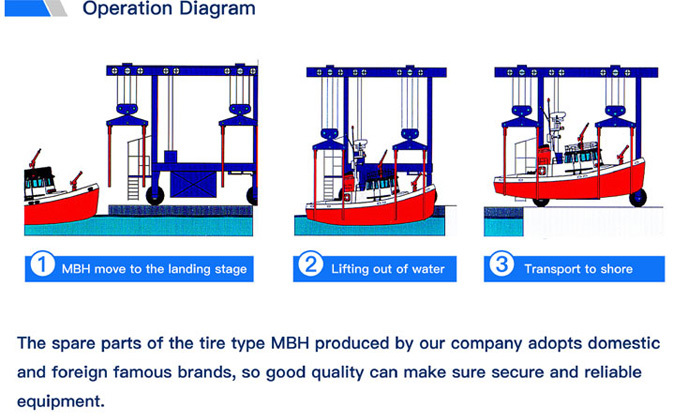 It can be used to handle various vessels, like fishing vessels, yachts, powerboats and heavy tugs. If you are looking for quality, safe and durable boat handling equipment, you should give us a call! 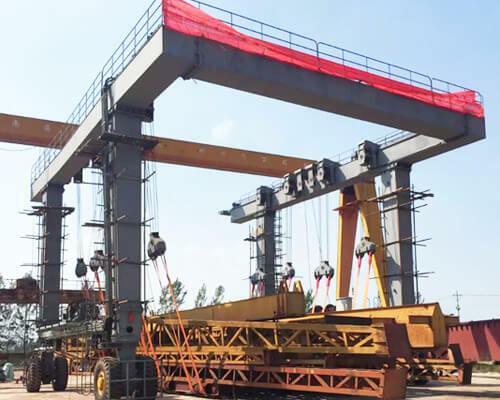 Double gantry U-frame structure enables you to handle a large-sized boat. The machine is hydraulically driven. Articulated pivot trunnion is intended to relieve structural stress that may be caused when travelling on uneven ground surfaces. A range of steering modes are available to provide flexible and convenient boat handling, such as fixing axle steering, 90 degree steering, Ackermann steering. The boat can be evenly supported by soft and quality slings, which will not cause damage to the hull of the boat. Variable span design makes it easy to accommodate your boat configurations. The distance between lifting points can be easily adjusted to improve load placement and ensure a synchronous lifting. Each winch is designed with separate lifting pumps to provide even lifting for front and rear hoist sets. 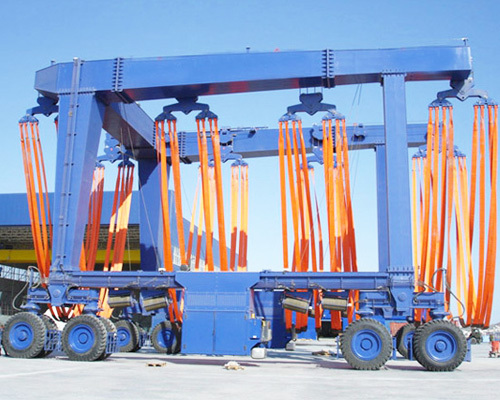 The equipment is coated with a durable paint system to prevent it from corroding in the harsh marine conditions. Steering mode: fixing axle steering, 90 degree steering, etc. Each parameter can be customized to your special requirements. There are a few things to consider in order to select the right type of marine boat handling equipment. You can discuss your required travel lift specifications with one of our professionals online. They will proposal the most appropriate and affordable solution for your application. 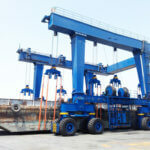 There are two main methods to control your marine crane, including remote control and cabin control. The remote control is the most economical option since it has low cost, simple operation and less maintenance. However, if you require a higher efficiency and increased working speed, a cabin control can offer what you need. The selection of control mode is largely determined by user’s preference, ease of use and financial considerations. Perform a routine check before commencing any lift, such as to check engine oil level, lifting straps, tires and wire cable to make sure they are in good working conditions. The personnel in working area should be restricted to those who are required for lifting operations. No vessel over rated load capacity is to be lifted. 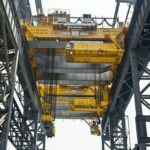 After lifting operation, the slings should be raised to above ground level, and the machine should be parked for proper water drainage. 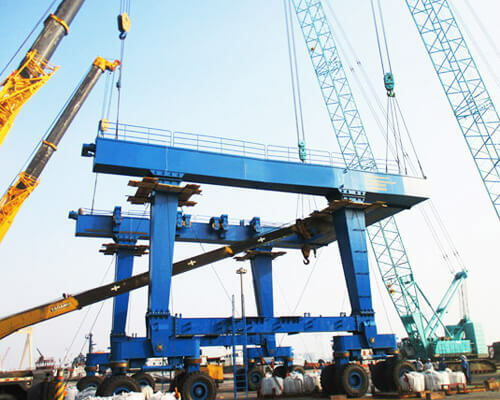 Our marine hoists are designed and manufactured according to five key elements: reliability, safety, durability, suitability and cost effectiveness. 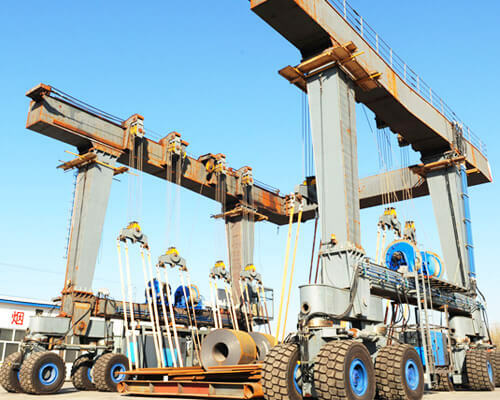 They are ruggedly constructed by using high quality steel and components to ensure decades of trouble-free operations. A superior paint system is applied to the machine for longer life and better appearance. With well-experienced engineers, we are able to customize a solution to suit your particular requirements. 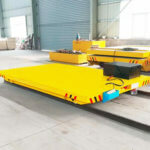 In addition to travel lift design and fabrication, we offer a complete service, including the equipment installation, commissioning, acceptance and maintenance. We also provide free technical advice if needed. The service is available at 7*24h every week. 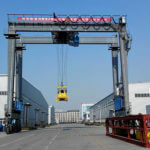 Interested in marine hoist? Get in touch with our sales team for the latest price.